Owners/manager: F.P. 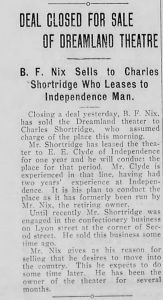 Stewart (proprietor & manager), George Wolfe, B.F. Nix, J.L. Wadsworth. Number of seats: “More than 400 seats.” (1913). 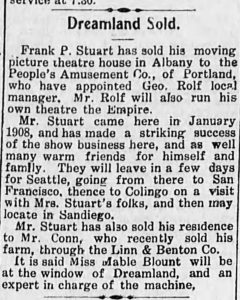 Therefore, that means that there were less than 400 seats before opening under new management in 1913 (as shown in the article clip below). Albany Democrat. 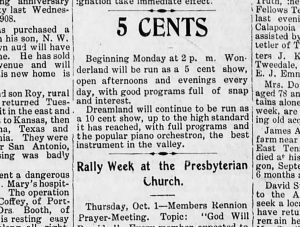 Friday, October 3, 1913. 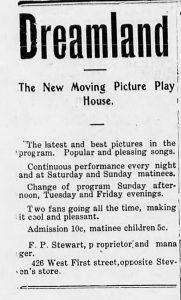 Programming notes: Vaudeville, moving pictures, music/songs. There was a change of program on Sunday afternoons and Friday and Tuesday evenings. 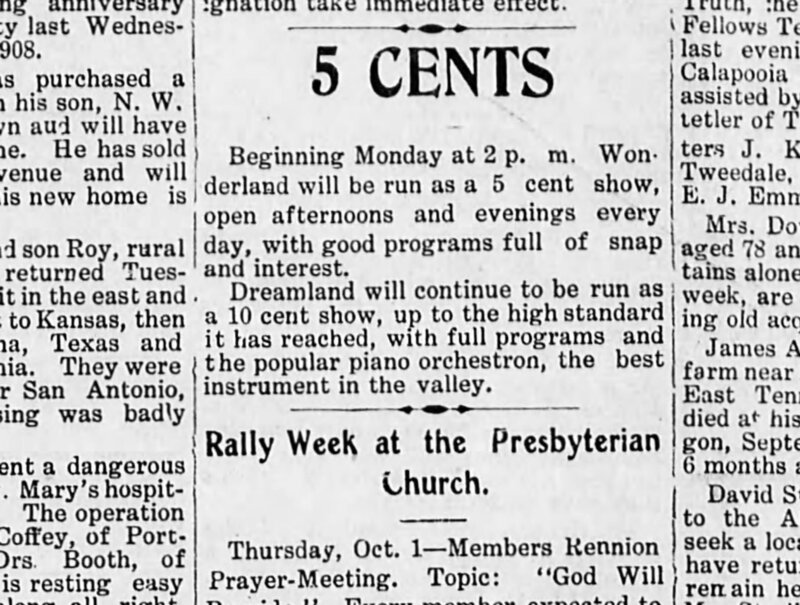 Promotional strategies notes: Admission was generally 10 cents for adults and 5 cents for children. Also, they promoted the fact that they had two fans running at all times. Albany Democrat. 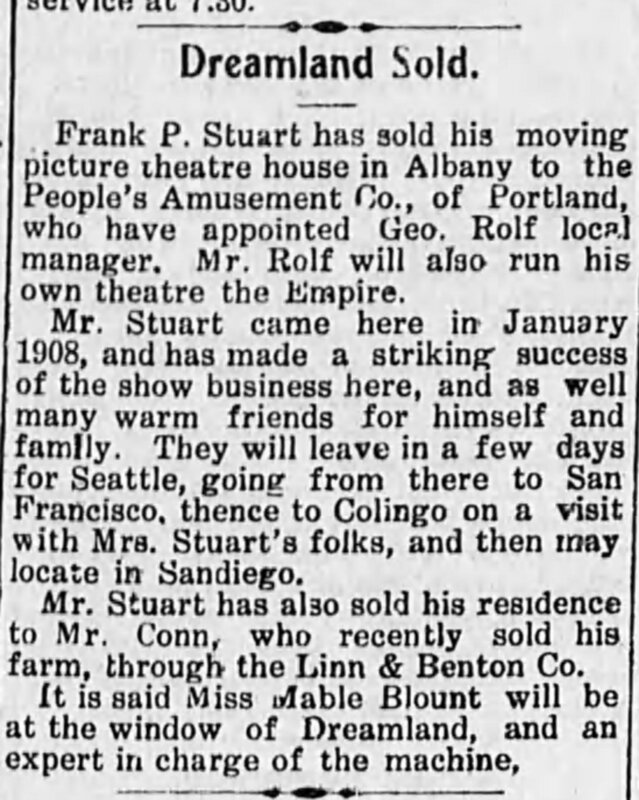 Friday, December 25, 1908. This article clip was interesting because it expresses that a real life baby was going to be given away on December 31 at the Dreamland Theatre. Albany Democrat. Friday, October 2, 1908. 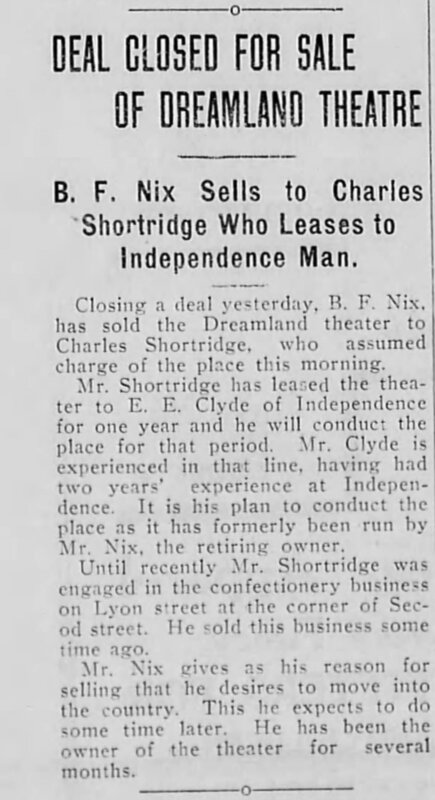 This article highlights the fact that a theatre was going to be opening up right next door to Dreamland Theatre and it was going to be called the Wonderland Theatre. Dreamland would continue to run as a 10 cent theatre while Wonderland would run for 5 cents. They described Dreamland as the theatre that would provide ‘full programs’ while Wonderland would be offering ‘good programs’ for half the price. Albany Democrat. Friday, July 10, 1908. 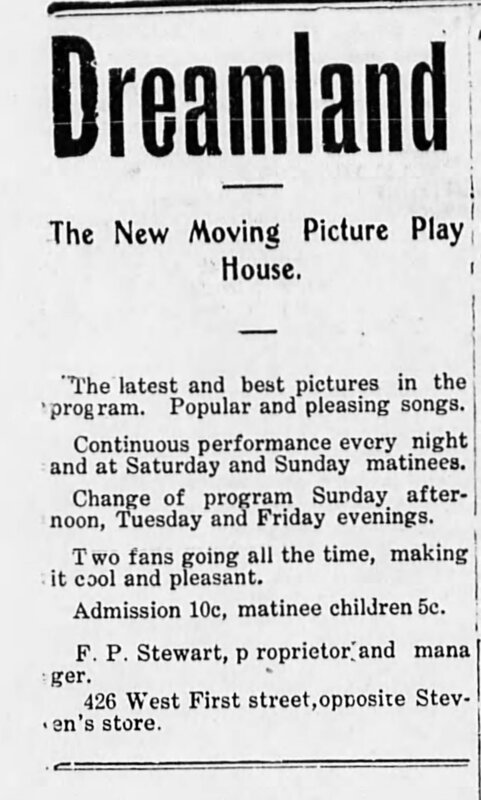 An example of an advertisement that highlights what would be shown as well as admission prices (10 cents). Albany Democrat. Friday, May 6, 1910. Albany Democrat. Tuesday, October 7, 1913. Albany Democrat, 1908, universityoforegon-newspapers-com.libproxy.uoregon.edu/search/#query=dreamland&dr_year=1908-1910&offset=33&s_place=Albany%2C+Oregon. Accessed 10 May 2018.